During the 2007 Annual Meeting of the American Academy of Ophthalmology in New Orleans, LA, NeoVista, Inc. provided new data from a one-year feasibility study of the company's novel beta radiation epi-retinal therapy for the wet form of age related macular degeneration (AMD). Also, please see the latest updated information about the CABERNET Trial below. NeoVista initiated this study to test the efficacy and safety of their novel beta radiation epiretinal therapy when used in combination with Avastin. In the ongoing non-randomized, multi-center feasibility study, 34 subjects with predominantly classic, minimally classic, or occult (with no classic) CNV received a single 24 Gy treatment of NeoVista's Strontium-90 epi-retinal therapy in combination with two injections of Avastin, one dose at the time of radiation delivery and another one month later. After twelve months follow-up, as shown in the updated graph below, subjects experienced a mean improvement of visual acuity of 13.1 letters using the Early Treatment Diabetic Retinopathy Study (ETDRS) test. Ninety-six percent of patients lost less than 15 letters of visual acuity. Only 15%, or five patients in the study, required additional injections of Avastin – four patients received one additional injection, and one patient received two injections – throughout the year, while 85% had no additional injections and, only 12% of patients experienced adverse events related to the procedure (retinal tear, retinal detachment, subretinal hemorrhage, and vitreous hemorrhage).One patient developed a retinal tear which was easily treated. Jeffrey S. Heier, MD, a retinal specialist and partner at Ophthalmic Consultants of Boston, presented the one-year followup data attained from 27 trial participants (mean age, 72 years) from June 2006 to April 2007 in two centers in Brazil and one in Mexico. Dr. Heier is a consultant for NeoVista, Inc.
"The one-year data provides important evidence that this novel concomitant treatment approach may provide more sustainable options for those suffering from this degenerative condition," said Dr. Heier. "NeoVista's targeted beta radiation in this study demonstrated its differences from previous attempts by the medical community to use radiation for the treatment of wet AMD. Additional on-going studies may well confirm the viability of this new therapeutic option for the elderly with wet AMD." Unlike previous forms of radiation therapy for Wet AMD, NeoVista's approach delivers the peak dose of radiation directly to the lesion without damaging the underlying choroidal vasculature. Utilizing strontium-90, the focused radiation is delivered to a target area 3 mm in depth and up to 5.4 mm in diameter. Importantly for patients, the systemic exposure to radiation is minimal, as the effective dose to the entire body from NeoVista's epi-retinal device is comparable to 15 minutes of exposure to the sun. "The ultimate promise of this therapy revolves around that fact that NeoVista's targeted radiation delivery system allows patients to continue living their lives, with significantly less injections, while also having the potential to save both patients and the healthcare system billions of dollars," said John N. Hendrick, President and CEO of NeoVista. "We look forward to unveiling the true impact of our therapy on patients and physicians now that our larger CABERNET trial is underway." The CABERNET (CNV Secondary to AMD Treated with BEta RadiatioN Epi-retinal Therapy) trial is a multi-center, randomized, controlled study which will enroll 450 subjects at 30 sites worldwide (20 in the United States). The study, which will evaluate the safety and efficacy of NeoVista's beta radiation epi-retinal therapy delivered concomitantly with the FDA approved antiangiogenic therapy, Lucentis, versus Lucentis alone, was started in June 2007. NeoVista, Inc. announced on April 17, 2008, that the U.S. Food and Drug Administration (FDA) had granted the company’s request to expand the number of sites participating in its pivotal Phase 3 trial from 10 to 30 in the United States. The approved expansion of CABERNET (CNV Secondary to AMD Treated with BEta RadiatioN Epiretinal Therapy) trial, which seeks to evaluate the safety and efficacy of the company’s novel epiretinal brachytherapy for the wet form of age-related macular degeneration (AMD), was dependent on the FDA’s review of 90-day safety data, typical of new-to-market medical devices. CABERNET is a multicenter, randomized, controlled study that will enroll 450 subjects at clinical centers worldwide. The study will evaluate the safety and efficacy of NeoVista’s epiretinal brachytherapy, delivered utilizing a limited vitrectomy, concomitant with two intravitreal injections of the FDA-approved antiangiogenic therapy Lucentis® (ranibizumab) versus Lucentis alone. For those enrolled in the trial arm utilizing brachytherapy, Lucentis is injected once at the time of the surgery and once again 30 days later. The co-primary endpoints in the CABERNET trial are 1) the noninferiority of epiretinal brachytherapy plus Lucentis versus Lucentis alone based on the proportion of subjects losing fewer than 15 letters on the Early Treatment Diabetic Retinopathy Study (ETDRS) chart at 12 months as compared to baseline or 2) the superiority of epiretinal brachytherapy plus Lucentis versus Lucentis alone based on the proportion of subjects gaining 15 letters or more on the ETDRS chart at 12 months. ● New Developments in posterior segment drug delivery – a discussion of potetial solid implants, such as Retisert and Vitrasert from Bausch & Lomb, and a subretinal implant system from SurModics called I-vation. And, finally, an interview with Dr. Judah Folkman, the father of anti-angiogenic agents, and the keynote speaker for the opening session of the AAO Meeting. ● New Non-Thermal Laser for Retinal Treatment – a brief discussion of the Ellex 2RT Therapy. - Additional information about the Ellex 2RT laser treatment. - Intravitreal therapy for vein-occlusive disease. Again, using briefs supplied by Ophthalmology Times and Ocular Surgery News, here are some additional highlights from the Retina 2007 Subspecialty Day, and retinal treatment highlights from the opening day of the main 2007 AAO Meeting, being held in New Orleans. Treating neovascular age-related macular degeneration with Lucentis resulted in a greater reduction in macular thickness but not a better visual outcome compared to treatment with Avastin, according to Adam Martidis, MD, and colleagues. In an independent retrospective study presented during Retina Subspecialty Day preceding the American Academy of Ophthalmology meeting, Dr. Martidas and his colleagues reviewed outcomes for 176 eyes treated for neovascular AMD with either intravitreal Avastin (Genentech) or Lucentis (Genentech). The treatments were administered at baseline and at months 1 and 2, with the data interpreted at month 3. The data was collected from six centers over a 6-month period. Patients included in the study had a baseline visual acuity between 20/40 and 20/320. None had been previously treated. At month 3, patients treated with Avastin showed a 24.7% decrease in absolute central macular thickness, compared with a 32.9% decrease in patients treated with Lucentis. Dr. Martidis said the ideal goal for each patient was a 200-μm thick retina. In patients treated with Avastin, 70.4% achieved this goal, compared to 92.7% of patients treated with Lucentis, he said. "What most of us were obviously concerned about-both as physicians and our patients are concerned about-is the visual results. I do emphasize that this study was not powered to achieve statistical significance for vision, and indeed we did not achieve a statically significant vision change [between the groups]," Dr. Martidis said. Patients treated with Avastin achieved a final visual acuity gain of seven letters vs. six letters for patients treated with Lucentis. Additionally, 20.9% of Avastin-treated patients gained three or more lines, compared with 34.2% of Lucentis-treated patients. "Both Avastin and Lucentis — I think we would all agree — are effective in the treatment of exudative AMD. In this limited sample size, there is no statistically significant difference in visual outcome between the two. However, there is a statically significant difference in anatomic advantage in favor of Lucentis as measured by OCT," Dr. Martidis said. In response to inquiries over the status of the much anticipated Avastin vs. Lucentis study, the lead investigator, Daniel F. Martin, MD, said the study was on track. Dr. Martin, delivered an update on funding for the Comparison of Age-Related Macular Degeneration Treatment Trials (CATT ) Study. A recently revised Medicare policy will support the use of Lucentis in the trial, and patients will have no out-of-pocket expense, he said. Genentech decided in July not to support the study or supply either of the drugs. "Despite numerous inquiries, we have been told that the decision is irreparable," Dr. Martin said. However, "we are unaffected by the ... decision," he said, reiterating that CATT is fully funded and ready to begin. In CATT, Dr. Martin and colleagues will prospectively compare the results of 1,200 patients randomly assigned to receive either Avastin or Lucentis. Enrollment is expected to begin in early 2008, with 1-year results released in early 2010. The initial clinical results were announced of a continuous study for non-thermal Retina Regeneration Therapy (Ellex 2RT, Ellex Medical Lasers Ltd.). The results showed the therapy's potential to make improvements in and stabilize visual acuity, as well as reduce retinal edema in patients with diabetic maculopathy and macular edema without causing any damage to the photoreceptors. The results were presented by Peter Hamilton, MD, FRCOph, the principal clinical investigator in the Ellex 2RT research program in St. Thomas Hospital, London, at the Retina Subspecialty Day. "The first phase clinical outcomes have confirmed [the therapy's] ability to treat diabetic maculopathy without damaging the neuro-retina," said John Marshall, PhD, principal investigator of the Ellex 2RT research program, the Frost Professor of ophthalmology at the Rayne Institute, and head of the academic department of ophthalmology at King's College, University of London. "This means that [retina regeneration therapy] may change the way diabetic maculopathy patients are treated and it shows potential for intervention in early stage age-related macular degeneration before significant loss of vision has occurred." "We are encouraged by the first patient data presented as it provides the assurance we were looking for to expand [retina regeneration therapy] research," said Peter Falzon, Ellex chief executive officer. "The next phase clinical trials will be essential in establishing [its] potential as an early stage therapy for retinal disease." "Ocular angiogenesis in experimental animals has been the bedrock basis of advances across the field of angiogenesis research, and it continues to illuminate future directions of therapy," renowned medical researcher Judah Folkman, MD, said during the keynote speech of the opening session of the annual meeting of the American Academy of Ophthalmology. Dr. Folkman, considered to be "the father of angiogenesis," treated attendees to a presentation detailing the history of angiogenesis research, beginning with his introduction of the term in a 1971 New England Journal of Medicine article. "When this paper was published, I was very happy, and I thought maybe now the field would really take off," he said, "but nothing happened for 10 years." During that time, he added, his laboratory developed bioassays for angiogenesis, including one for cornea. Today, at least 10 angiogenesis inhibitors, or drugs that have anti-angiogenic activity plus anti-cancer activity from other mechanisms, are approved by the FDA, Dr. Folkman said. "In 2006, 1.2 million people received prescriptions for FDA-approved drugs for the treatment of cancer or for age-related macular degeneration," he added. As for the future, Dr. Folkman concluded, "There is a need for drugs that could maintain long-term suppression of pathologic angiogenesis [in the eye] without side effects, and we're working on three of those." Off-label use of intravitreal drugs may have a promising future in the treatment of patients with diabetic retinopathy, but currently the dosing of these drugs is suboptimal, according to George Williams, MD, of the Beaumont Eye Institute, Royal Oak, MI. Controlled clinical trials are lacking and follow-up periods are often too short to reach any definitive conclusions about safety and efficacy. Dr. Williams described the use of steroids and anti-vascular endothelial growth factor (VEGF) drugs that can be used as monotherapy, combination therapy, or as adjunctive therapy with laser or vitreous surgery. Steroids down-regulate VEGF production, anti-inflammatory effects, and stabilize cellular membranes, he said. Triamcinolone acetonide resolves edema following injection, but the side effects include glaucoma and cataract formation. A drug-delivery system (Posurdex, Allergan) allows implantation of dexamethasone with a significant increase in vision at 90 and 180 days after surgery in patients with persistent macular edema. This implant is not associated with the development of glaucoma, but increases in IOP occurred. A fluocinolone acetonide intravitreal implant (Retisert, Bausch & Lomb) has been implanted in 180 patients with diabetic macular edema. Three years after surgery, there was a significant improvement in visual acuity compared with laser, but there was also the associated complication of increased IOP, with 30% of patients requiring filtration surgery, he said. Anti-VEGF drugs such as pegaptanib sodium (Macugen, OSI/Eyetech/Pfizer) and Avastin (Genentech) are being used in patients with diabetes. Pegaptanib was shown to induce neovascular regression, increase visual acuity, and decrease retinal edema 3 weeks after injection every 6 weeks. However, the results are complicated by rebound of neovascularization after discontinuation of treatment. Avastin resulted in a short-term increase in visual acuity and decreased edema at 3 weeks but not later and the results were not as good as with laser. Combination treatment composed of laser and intravitreal drugs may increase the efficacy of and reduce the side effects of photocoagulation, according to Dr. Williams. "The preliminary experience with dosing of intravitreal drugs for diabetic retinopathy is suboptimal," Dr. Williams said. "Improved drug-delivery systems for steroids and anti-VEGF drugs are needed. Longer follow-up is needed to determine the efficacy and safety of treatment." Intravitreal therapy for venous occlusive disease is promising in the short term, however, multiple injections are needed, dosing schedules are presently unclear, and rebound has to be evaluated, said Peter Kaiser, MD, of the Cole Eye Institute, Cleveland Clinic, Cleveland, OH. "Venous occlusive disease is the second leading cause of decreased visual acuity in diabetic retinopathy, with 25% of patients having worse than 20/200 vision," Dr. Kaiser said. Laser treatment was not effective for these patients in two randomized studies and observation is the only therapy for central vein occlusion, he said. Laser has shown more improvement for branch vein occlusion but, in the long term, results in only a one-line increase in vision, he added. Steroids are an obvious choice for vein occlusion since they decrease vascular permeability, stabilize the blood-retinal barrier, and address periphlebitis, according to Dr. Kaiser. In all studies, visual acuity improved. However, the drugs are associated with increased IOP and cataract, he said. The Standard Care versus Corticosteroids for Retinal Vein Occlusion Study is taking a close look at the drugs for retinal vein occlusion. Anti-vascular endothelial growth factor (VEGF) drugs are also being evaluated. Two doses (1 and 0.3 mg) of pegaptanib sodium (Macugen, OSI/Eyetech/Pfizer) were evaluated in a phase II study. After every 6-week dosing (five injections), the visual acuity increased with both doses, but the end result was not much better than that achieved with laser, Dr. Kaiser reported. One injection of Avastin (Genentech) achieves "very nice" clinical features and optical coherence tomography findings, according to Dr. Kaiser. After 4 months, however, the edema returns, he said. Similar results were achieved with Lucentis (Genentech). The BRAVO and Cruise studies are enrolling patients to evaluate the use of Lucentis versus controls for branch and central retinal vein occlusion. Again, using briefs supplied by Ophthalmology Times and Ocular Surgery News, here are the highlights from the second day of the Retina 2007 Subspecialty Day presentations. First, here are the reports from the special session held at the end of the day, wherein Dr. Susan Desmond-Hellmann, president of product development for Genentech, spoke to the assembled retinal specialists and then answered some of their questions. In a special session held immediately after the close of Day 2 of the American Academy of Ophthalmology (AAO) Retina Subspecialty Day program, Susan Desmond-Hellmann, MD, MPH, president, product development, Genentech, implored the ophthalmology community to work in collaboration with the company in the interest of achieving the common goal of better patient care. Speaking on behalf of the manufacturer regarding its decision to stop distribution of bevacizumab (Avastin) to compounding pharmacies, Dr. Desmond-Hellmann told attendees that in the short time she had to speak, she would not be making a corporate presentation defending the development of ranibizumab (Lucentis) or the recent actions relating to bevacizumab. She also expressed hope that ophthalmologists recognized recent efforts the company had made toward achieving a resolution as well as the challenges it faces operating in a highly regulated industry. Dr. Desmond-Hellmann emphasized that the manufacturer will not interfere with the ophthalmologist's prescribing choice. "When we made our decision about the compounding pharmacies our belief then — and our belief now — is that physicians will still be able to obtain Avastin," she said. Genentech has cited the U.S. Food and Drug Administration's concerns over the sterility and packaging of Avastin (bevacizumab) as its primary motivation behind the decision. "We cannot jeopardize our commitment to tens of thousands of other patients by risking FDA action against us," Dr. Desmond-Hellmann said. To that end, the company is actively working to address existing concerns and aims to implement changes that will expedite patient access to treatment. "We're willing to do everything possible to make sure patients have access to Lucentis (ranibizumab, Genentech)," she said. Like bevacizumab, Lucentis inhibits VEGF. However, as physicians at the session pointed out, Lucentis is much more expensive. Dr. Desmond-Hellmann pointed out that the manufacturer is committed to addressing unmet therapeutic needs in ophthalmology, and she acknowledged the important role of ophthalmologists in the development of ranibizumab as a treatment for age-related macular degeneration (AMD) and its investigation in other indications. The pre-marketing program of ranibizumab for AMD together with its current active clinical development program, which includes ongoing phase III trials in diabetic macular edema and retinal vein occlusion as well as nearly 50 investigator-sponsored trials under review, underscore the progress and promise that are possible through cooperation, she said. "There are thousands of patients who come to you desperate for their sight and you have nothing to help them. That will continue to be the case if we don't put our collective efforts together towards solutions," Dr. Desmond-Hellmann said. She relayed that in 1995, the manufacturer was embroiled in a somewhat similar situation with oncologists regarding the development of trastuzumab (Herceptin) as an adjuvant treatment for a serious and deadly form of breast cancer. However, through the help and collaboration of leading oncologists and patient advocates, a resolution was achieved that led to that drug's approval and changed the prognosis of affected women in the future. Reflecting on that history, Dr. Desmond-Hellmann ended by saying she hoped she might be invited back to the 2017 annual meeting of the AAO and be able to relate to the audience how the manufacturer and ophthalmologists made together the conscious decision to stop resisting one another and work together to achieve more than either could do alone. "On behalf of Genentech, you have my commitment we will do everything possible to make this a reality," Dr. Desmond-Hellmann said. During the subsequent Q&A session, Daniel F. Martin, MD, a member of the session's panel, questioned Genentech's refusal to support the upcoming Comparison of Age-Related Macular Degeneration Treatment Trials (CATT) trial, which is expected to evaluate both bevacizumab and ranibizumab in the treatment of age-related macular degeneration. The trial is jointly sponsored by the National Institutes of Health and the National Eye Institute. "We are the only trial that is sufficiently powered to show a difference," Dr. Martin said. Genentech will not support the CATT trial because ranibizumab has already been approved as a safe and effective treatment for AMD, Dr. Desmond-Hellmann said. "We are challenged by the CATT trial because we feel that the need is (already) met," she said. The visual acuity improvements from implantation of the Artificial Silicon Retina (ASR device, Optobionics Corp.) for treatment of vision loss associated with retinitis pigmentosa were "underwhelming," with the 2-year data showing that only 8% of implanted eyes gained 10 letters or more, according to John Pollack, MD. The device, which is 2.0 mm in diameter and 25 microns thick, is proposed to work by solar power. The light incident on the surface creates a negative charge on the chip. The cells in contact with the chip surface are stimulated and release neurotrophic factors, which results in improved functioning of existing retinal cells. The device is implanted during vitrectomy through a retinotomy, Dr. Pollack, assistant professor of ophthalmology, Rush University Medical Center, Chicago, explained. During a feasibility study at three clinical sites, 20 patients were implanted with the device in one randomly selected eye. Adverse events included migration and fracture of the device and chronic anterior segment implantation, cystoid macular edema, visually relevant cataract, and retinoschisis/macular hole. "The 2-year data indicated that 16% of eyes had an increase of 10 letters compared with 5% of the fellow eyes, and 11% had a decrease of 10 letters compared with 21% of the fellow eyes," Dr. Pollack reported. When the investigators evaluated the 1-year data and did subgroup analysis they considered confounding factors of cataract progression and dilated pupils during vision testing, which increased glare, reduced contrast sensitivity, and possibly negatively affected the vision measurements. They found that in eyes that had neither or one confounding factor, 40% of eyes gained 10 or more lines compared with 0% in the fellow eyes. When they evaluated the 18- to 24-month data, Dr. Pollack reported that the gap narrowed with 40% of eyes that received the device having gained 10 lines of vision compared with 20% of the fellow eyes. In a phase II expansion trial that began in summer 2006 in Mexico City, all 12 patients were pseudophakic and vision testing was done in the undilated state to address the issue of the confounding factors. In those patients, 8% of implanted eyes gained 10 letters or more compared with 16% of fellow eyes that gained 10 letters or more; 16% of the implanted eyes had a decrease of 10 letters or more compared with 0% of the fellow eyes. "Implantation of the ASR device has not resulted in significant improvements in Early Treatment Diabetic Retinopathy Study vision. It is possible that the device can be used as an auxiliary power drive or a platform for other forms of subretinal neurostimulation. This intellectual property was purchased by Intelligent Medical Implants," Dr. Pollack said. Future studies of an investigational subretinal implant used to treat retinitis pigmentosa must take into account potential confounding factors that can impact vision testing. Data from studies of the implant are becoming more reliable now that these factors have been eliminated, according to Dr. Pollack. The phase 2 expansion study, undertaken by Hugo Quiroz-Mercado, MD, of Mexico City, includes 12 patients with retinitis pigmentosa. "Elimination of the confounding factors in the Mexico study led to improved reliability of the study," Dr. Pollack said. Anti-angiogenic therapy for aggressive posterior retinopathy of prematurity (ROP) may be a feasible therapy for these children with this form of ROP, which develops in profoundly immature neonates. The BLOCK-ROP study, which is slated to begin soon, will add to the limited knowledge of the safety and efficacy of an anti-vascular endothelial growth factor (VEGF) drug in treating posterior ROP, Anthony Capone Jr., MD, reported during Retina Subspecialty Day at the annual meeting of the American Academy of Ophthalmology. "With the advent of FDA-approved drugs for anti-VEGF treatment, the possibility of treating eyes off-label with an anti-VEGF drug has become possible," he said. The rationale for this treatment approach is that VEGF promotes retinal vascularization. The current standard of care is laser treatment to the peripheral retina, which is not universally effective in fostering regression of ROP. The largest experience to date with anti-VEGF therapy for ROP was carried out in Mexico, Portugal, and New York, in which 53 eyes were treated with one injection of bevacizumab (Avastin, Genentech) and followed for a mean of 6 months. The study included patients who received the standard of care for ROP, eyes that were untreated because of poor visualization, and eyes with high-risk pre-threshold ROP in an institution where laser was unavailable, Dr. Capone recounted. He is clinical associate professor of ophthalmology, Oakland University, Royal Oak, MI. "All eyes responded favorably to treatment regarding neovascularization; five eyes worsened. There were no serious systemic adverse events. The authors concluded that further studies were needed to determine the safety and long-term efficacy of the treatment," Dr. Capone said. The BLOCK-ROP study, a phase I trial will be carried out in the United States and Canada beginning in the fourth quarter of 2007, picks up the challenge and will evaluate the safety of one injection of bevacizumab (0.75 mg) into the vitreous cavity in 22 patients. "The scientific rationale for using anti-VEGF therapy for ROP is compelling. This is an exciting time in ROP therapy. Approval of standard phase I and II data is appropriate considering the vulnerability of the target population. In the interim, caution is warranted with use of anti-VEGF drugs outside of a clinical trial in premature neonates," Dr. Capone concluded. Spectral domain optical coherence tomography (SD-OCT), the latest generation of the technology, is a breakthrough because it has dramatically cut the time required to obtain images by eliminating the moving mirror that was a component of standard OCT, according to Cynthia Toth, MD, professor of ophthalmology, Duke University Medical Center, Durham, NC. In addition to being 50 times faster than conventional OCT, SD-OCT has improved resolution because of improved processing. Another benefit is decreased patient movement artifact, especially in pediatric patients. "In age-related macular degeneration, there is often motion artifact. It is difficult to sort out drusen and differentiate them from patient motion that could be either or a pigment epithelial defect or normal retinal pigment epithelium (RPE) choroid. Using SD OCT it is easier to isolate drusen from the underlying baseline RPE and to define whether pigment epithelial detachments or RPE abnormalities are present," Dr. Toth stated. The SD-OCT data can be integrated with the information obtained from angiography and fundus examinations, which allows identification of the location of an abnormality found on OCT. "One benefit of SD-OCT is the creation of the summed voxel projection (SVP), which is helpful for orientation of individual OCT scans. One can collapse 3-D OCT volumes along the depth axis to form a 2-D plane, summing pixels to calculate one representative pixel intensity along each line in the projection," she explained. As a result of prominent shadowing from the retinal vasculature, the SVP image is similar to a fundus photograph and this image can be used to orient the SD-OCT image to a fundus image. Drawbacks of the technology include large datasets, the need to integrate data with conventional imaging, and normative data are required for the new systems, there are a number of systems from which to choose. An advantage is the availability of portable systems. "Three-dimensional SD-OCT offers the potential to identify biomarkers and measure changes in disease over time. For clinical and research use, improved methods are needed to export, analyze, summarize, and manage data. These are on the way," Dr. Toth concluded. 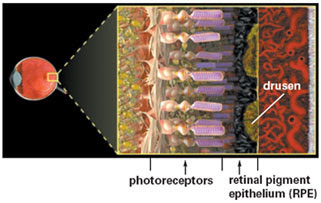 With this technology, short pulses of laser energy are used to stimulate the retinal pigment epithelium. The 532-nm wavelength used for a duration of 3 nanoseconds creates a 400-μm spot on the pigment epithelium that does not damage the overlying retina, according to Dr. Hamilton. The researchers looked at 18 patients over the course of 29 treatment sessions, measuring progress with color photography and fluorescein angiography. The results showed that central macular thickness, as measured on optical coherence tomography (OCT), decreased by more than 5% in 16 patients. It was maintained within 5% in seven patients. And it was increased by more than 5% in six patients. Dr. Hamilton said the advantages of the laser include: very short exposure time, visual acuity improvements, ability to treat close to the macula, no black holes visible at the time of exposure and good microperimetry. "We can get right in close to the macula without any fear of causing an enlarging burn," he said. "Because this laser is so gentle and because it is not compromising the outer part of the retina, we can treat large areas." Dr. Hamilton said further study is needed to compare the laser with conventional treatments. I have received brief writeups from both Ophthalmology Times and Ocular Surgery News covering the first day of the Retina 2007 Subspecialty Day presentations. Here are some of the highlights, along with links to the various stories. The 2-year results of the PrONTO Study, an exploratory open-label trial, indicated that intravitreal injection of ranibizumab (Lucentis, Genentech) produces rapid improvements in visual acuity and findings on optical coherence tomography (OCT) in patients treated for neovascular age-related macular degeneration, said Philip Rosenfeld, MD, PhD professor of ophthalmology, Bascom Palmer Eye Institute, University of Miami. Forty patients underwent three consecutive monthly injections with 0.5-mg intravitreal ranibizumab during the first year and three patients withdrew during year 2. From months 3 to 24, OCT images were obtained monthly and fluorescein angiography images every 3 months with the goal of determining if OCT-guided regimens could be used over 2 years to maintain visual acuity improvements and OCT outcomes achieved after the three consecutive monthly doses of the drug. "By day 1 after treatment, we saw about a 50-μm decrease in the central retinal thickness, a 190-μm decrease by 3 months, a 178-μm decrease by 12 months, and a 215-μm decrease by 24 [months]," Dr. Rosenfeld reported. Patients each received an average of 10 injections during the study period. There was an increase in visual acuity (6 letters) by 14 days after the first treatment that continued to 3 months (11 letters). At 24 months, the mean improvement in visual acuity from baseline was 10.7 letters. "The PrONTO Study showed that visual acuity and OCT changes appeared to be rapid after intravitreal ranibizumab," he concluded. "The OCT changes always preceded the visual acuity changes, whether for better or worse. OCT-guided treatment appears to preserve the benefits seen after three monthly doses of ranibizumab. A larger prospective study is necessary." Visual acuity endpoints in the ANCHOR Study showed that ranibizumab (Lucentis, Genentech) surpassed photodynamic therapy (PDT) with verteporfin, (Visudyne, Novartis Ophthalmics/QLT) for treating predominantly classic choroidal neovascularization lesions in age-related macular degeneration, reported Jeffrey Heier, MD, assistant professor ophthalmology, Tufts University School of Medicine, and clinical instructor in ophthalmology, Harvard Medical School, Boston. "Ranibizumab was found to be a remarkably consistent therapy," said Dr. Heier, Analysis of subgroups in the 2-year ANCHOR Study indicated that the treatment effects of ranibizumab were consistent with all of the primary findings of the drug. Regarding age, the visual acuity results were consistent across all age groups, with the patients treated with PDT more likely to lose three or more lines of visual acuity. "A gain of about three lines or more of vision was very likely in most age groups treated with ranibizumab," he said. "This finding was slightly less robust in the oldest patients." Regarding baseline vision, the patients with better vision who were treated with PDT were more likely to lose three lines of vision, according to Dr. Heier. Patients treated with ranibizumab had very consistent results; the only patients who did not gain three lines or more were those with the highest baseline vision, he said. Compared to PDT, ranibizumab showed a better gain in vision and a threefold greater decline in leakage. The overall treatment benefits were seen across all age groups and lesion sizes, he said. The ANCHOR study was a multicenter, double-masked, controlled phase 3 study that randomly assigned 423 patients to either verteporfin PDT plus monthly sham or sham verteporfin PDT plus monthly intravitreal ranibizumab, dosed at either 0.3 mg or 0.5 mg.
"Ranibizumab remains a consistent and highly effective treatment," Dr. Heier concluded. The substantial difference in cost between ranibizumab, which has U.S. regulatory approval, and off-label bevacizumab presents an economic and moral dilemma for ophthalmologists, according to George A. Williams, MD. "The retina world changed for better and forever" when bevacizumab (Avastin, Genentech) was introduced as a treatment for AMD [age-related macular degeneration]. He described its impact as "the bevacizumab tsunami, which continues today." To conduct his economic analysis of the two drugs, Dr. Williams started with the assumption that ranibizumab and bevacizumab are equally effective and are used at the same frequencies. On a microeconomic level, he looked at the cost of each medication both to the physician and to the patient. On a macroeconomic level, he evaluated the cost of each drug to Medicare. For the physician, bevacizumab costs $45 and ranibizumab costs $2,030.92 per injection; for the patient, Medicare co-pays are $9 and $406, respectively. Referring to delayed reimbursements, Dr. Williams called this the "no pay co-pay." Dr. Williams estimated that ranibizumab is 44 times more expensive than bevacizumab, on a macroeconomic scale. The disparity raises the question of efficacy vs. cost effectiveness. If put to "the mother test" — referring to which drug surgeons would choose to administer to their mothers — bevacizumab might fail, even though it is cheaper. He said the upcoming CATT study, the much-anticipated head-to-head comparison of the two drugs funded by the U.S. National Institutes of Health and the National Eye Institute, will hopefully shed more light on the efficacy and safety of both drugs. Citing the downturn in sales of verteporfin and pegaptanib, David F. Williams, MD explained how bevacizumab has greatly impacted age-related macular degeneration treatment, despite the fact that is has not gained U.S. approval for treating the disease and the lack of clinical trial data to support its use. "In 2005 and early 2006, mostly anecdotal reports existed regarding the efficacy of intravitreal bevacizumab (Avastin, Genentech) for neovascular AMD. However, the favorable short-term clinical efficacy was so apparent that use of intravitreal bevacizumab spread rapidly among the retina community,". While there are no data that show the dominance of bevacizumab use to treat neovascular AMD, indirect evidence can be found in sales trends for other primary treatments that were in use in 2005 when bevacizumab first emerged. "The cost differential between off-label bevacizumab and the other pharmacological treatments for neovascular AMD was striking," he said. From the time bevacizumab efficacy data were introduced by Philip J. Rosenfeld, MD, PhD, until the last quarter of 2006, pegaptanib sales fell 26% while verteporfin sales fell 63%. In addition, the approval of ranibizumab in July 2006 pushed verteporfin sales down 82% while pegaptanib sales fell 92%. "The unprecedented growth of off-label bevacizumab as a primary therapy for AMD occurred in the setting of anecdotal reports, reports of non-randomized, non-controlled, small clinical series, and individual personal clinical experience," Dr. Williams said. "It has persisted in the setting of the availability of a highly efficacious, but expensive, [U.S. Food and Drug Administration-approved] product." Dr. Williams pointed to four reasons for this growth: the value of evidence-based medicine, the value of mass clinical experience, pricing of FDA-approved drugs and the power of physician choice. VEGF Trap (Regeneron Pharmaceuticals) has been seen in two studies (CLEAR-IT AMD 1 and CLEAR-IT AMD 2) to be safe, bioefficacious, and tolerated in the eyes of patients with neovascular age-related macular degeneration. The 2- and 4-mg doses demonstrated more bioactivity than lower doses evaluated, according to Quan Dong Nguyen, MD. The CLEAR-IT AMD 1 study evaluated six doses of VEGF Trap (0.05, 0.15, 0.5, 1, 2, or 4 mg) with each patient receiving one intravitreal injection of one dose and then followed for 6 weeks, reported Dr. Nguyen, assistant professor of ophthalmology, Wilmer Eye Institute, Johns Hopkins University School of Medicine, Baltimore. Twenty-eight patients then received one intravitreal injection of either 0.15 or 4 mg and were followed for 8 weeks. Investigators found that the injections in both parts of the study were well tolerated and no ocular inflammation developed. The retinal thickness decreased in the second part of the study, and the treatment duration was longer with administration of the higher dose, he said. In the CLEAR-IT AMD 2 study, the patients were randomized into five groups and the following VEGF Trap doses were evaluated: 0.5 mg every 4 weeks, 2 mg every 4 weeks, 0.5 mg every 12 weeks, 2 mg every 12 weeks, and 4 mg every 12 weeks. Analysis of 159 patients indicated that "overall there was a reduction in the central retinal thickness across all time points for 8, 12, and 16 weeks," Dr. Nguyen said. There was also a gain in visual acuity at all time points. When the investigators evaluated the subgroups for efficacy, administration of 0.5 mg every 4 weeks and 2 mg every 4 weeks resulted in the greatest gains in visual acuity and the greatest reductions in the central retinal thickness at 12 weeks after treatment. Improvement continued at the 16-week evaluation. At week 12, there was no evidence of any ocular or systemic complications. Dr. Nguyen concluded that VEGF may play a role in the armamentarium of therapy for choroidal neovascularization. He also noted that these results aided the design of the phase III trial in which 0.5 mg for 4 weeks, 2 mg for 4 weeks, 2 mg for 8 weeks, and 0.5 mg of ranibizumab (Lucentis, Genentech) for 4 weeks will be evaluated. Topical therapy to treat posterior segment disease is possible despite the limitations of the blood-retinal barrier. The effective route of drug penetrance of topical therapy is either by the transcorneal route or by the transscleral/conjunctival route, said Baruch Kuppermann, MD, PhD, chief of the Retina Service, Department of Ophthalmology, University of California, Irvine. A few such drugs are currently under development, and the hope is that they will eliminate the complications associated with intravitreal injections of drugs, he said. • 801 kinase inhibitor (TargeGen) has activity against vascular endothelial growth factor (VEGF) receptor/PDGF receptor/Src family kinases and stops leakage, angiogenesis, and inflammation. In animal studies, the drug has been shown to have high concentrations in the anterior segment, lower effective concentrations in the posterior segment, very low concentrations in the aqueous and vitreous, and extremely low concentrations in the plasma. • ATG2 (mecamylamine) (CoMentis) is a powerful nonselective nAChR antagonist that has reduced angiogenesis in animal models and inhibits VEGF synthesis/release and responses. Topical mecamylamine was seen to penetrate the retina-choroid in mice, probably by the transscleral-conjunctival route. • OC-10X (Ocucure) is a nontoxic vascular targeting agent with selective tubulin inhibition. The agent is lipid soluble and crosses the human cornea; it achieves therapeutic concentrations at the retina-choroid. In rats, the drug, when given once every hour for 4 hours, achieved a corneal level of 100%, a lens/vitreous level of 11%, and a retina-choroid-sclera level of 83%. • OT-551 (Othera) catalytic antioxidant has multiple modes of action, i.e., antioxidant, antiangiogenic, and anti-inflammatory. The agent penetrates the cornea and sclera and reaches the retina. It also suppresses photo-oxidative damage in the retinal pigment epithelium and photoreceptors. A phase II study is ongoing for geographic atrophy, neovascular age-related macular degeneration, and cataract. • Pazopanib (Glaxo-Smith-Kline) has completed a phase I trial with 38 healthy volunteers. This compound has been in development to treat solid tumors, according to Dr. Kuppermann. "Historically, we have never contemplated the use of topical therapy for posterior segment disease because of poor ocular penetrance," he said. "The small molecule drugs are being developed to meet this challenge. They have shown good posterior segment penetrance, safety, and efficacy." New extended delivery methods are under development and in the future should facilitate more effective administration of numerous types of ocular agents, said William F. Mieler, MD, professor and chairman, department of ophthalmology and visual science, University of Chicago. Dr. Mieler said that new methods are needed to lessen the side effects and invasiveness of current methods as well as to reduce systemic side effects. Listing delivery methods with potential to address these concerns, Dr. Mieler noted that several types of solid implants are on the market already, such as a fluocinolone acetonide intravitreal implant (Retisert, Bausch & Lomb) and a ganciculovir intravitreal implant (Vitrasert, Bausch & Lomb). A subretinal implant system (I-vation, SurModics) has been tested in rabbits and appears to be capable of long-term sustained delivery. Microspheres of biodegradable polymers are also being explored and could be a means of reducing toxicity during drug delivery, Dr. Mieler said. Studies are under way of delivering pegaptanib sodium (Macugen, OSI/Eyetech/Pfizer), and the feasibility of delivering other products by this route is also being investigated. Thermoresponsive gels are another promising delivery method; one such product is currently on the market, although not for ophthalmic use, Dr. Mieler said. At the University of Chicago and the Illinois Institute of Technology, investigators are studying thermoresponsive hydrogels and have developed one product that becomes a gel at body temperature in less than 1 minute. They hope to design a product that can be placed in a 27- to 30-gauge needle and delivered either intravitreally or in the juxtascleral space. The investigators are studying the delivery of bevacizumab (Avastin, Genentech) by this method. Surgical-based delivery techniques include microcannulation of the suprachoroidal space. In addition, SurModics has developed a subretinal cannula (RetinaJect). A 25-gauge needle is used to transconjunctivally enter the vitreous; a 39-gauge cannula is then advanced to create the retinotomy. Encapsulated cell technology (Neurotech SA) is also being tested as a novel means of drug delivery and has been shown to be safe and effective in early studies. Finally, Ocular Surgery News interviewed Dr. Judah Folkman, who will give the keynote address during the opening session of the AAO meeting on November 11th. The concept of anti-angiogenic agents, which has revolutionized cancer research, has led to the development of various ophthalmic therapies, according to a prominent medical researcher. Angiogenic molecules include vascular endothelial growth factor, a protein contributing to age-related macular degeneration, diabetic retinopathy and other ocular diseases. In a 1971 New England Journal of Medicine article, Dr. Folkman hypothesized that tumor growth depends on angiogenesis, or the growth of new blood vessels. His theory was criticized throughout the biomedical community, but early discoveries soon silenced the detractors. Early angiogenesis experiments were performed in rabbit eyes, whose corneas were ideal for detecting new blood vessels, Dr. Folkman said. “In order to prove that a tumor could make a protein that could diffuse from the tumor and stimulate new capillaries, the only way we could show that was in the eye,” he said. The experiments demonstrated that proteins from the tumor triggered the growth of blood vessels. Before those experiments, the idea of such proteins existing was considered far-fetched, he said. Dr. Folkman and fellow researchers later used tiny polymer implants that released angiogenic proteins into a rabbit cornea. After the implants were removed and diffusion of angiogenic proteins was halted, the corneal blood vessels gradually disappeared, he said. In ophthalmology, angiogenesis research has reached new heights with the development of new drugs such as Lucentis (ranibizumab, Genentech), Dr. Folkman said. On the eve of the American Academy of Ophthalmology meeting in New Orleans, scheduled to begin tomorrow (November 9-14), the Center for Preventative Ophthalmology and Biostatistics at UPenn has finally updated their website on the CATT Study. The website now contains almost everything you need to know about the study. In particular: What Is Neovascular AMD and Why Is the CATT Study Important? This section provides an explanation of what AMD is and how it is treated, along with some information about the CATT Study, its design and aims. There are two links within the document: one describes the eligibility requirements, while the second is a 258 page Manual of Procedures, which contains everything your ever wanted to know about the CATT Study. The only changes I noted from the original information I have provided are that enrollment is now scheduled to begin January 1st, and the number of clinical sites has been reduced to 44. The location of the 44 sites is not provided on the website (yet), but hopefully will be included soon.